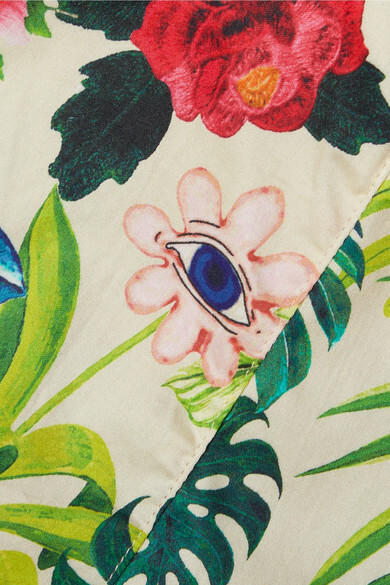 Miguelina's 'Joone' shorts are printed with tropical blooms, palm leaves and birds inspired by late artist Frida Kahlo's lush garden at her Mexico City home. Made from lightweight cotton-voile, they have a waist-defining high-rise shape and scalloped crochet trims. Wear yours with the matching shirt and slides on vacation. Wear it with: HEREU Tote, Isabel Marant Necklace, Isabel Marant Choker, Kenneth Jay Lane Cuff, Sophie Buhai Earrings, Chloé Ring, Loren Stewart Ring, Sophie Buhai Cuff, Tohum Ring.